BASEBALL HONEYMOON PLAYS NOSTRADAMUS FOR 2009! For those of you, like me, who can’t get enough of USA Today/Sports Weekly baseball guru PAUL WHITE talking baseball, the first half of the show is for you as he (and we) talk about our picks to win each division and each league’s “big” awards (MVP, CY and Rookie of the Year). Team Netherlands was the talk of the World Baseball Classic. 19-year-old pitcher Juancarlos Sulbaran was the talk of Team Netherlands. And yes, it’s spelled “Juancarlos,” one word. I don’t know about the rest of you, but watching this guy pitch in the game against Puerto Rico was one of the highlights of that tournament for me. I already knew a lot of the veteran players and coaches (hi Bam Bam! Hola Sir Eugene!) but was unfamiliar with Sulbaran. However, since I was working on the Cincinnati Reds organization preview at the time, I definitely took notice. In fact, I think I looked like one of those cartoon characters whose eyes pop out of their head (lovely image, no?). Sure, he finished the tournament with the highest ERA of any of the 13 pitchers on that impressive Dutch staff, allowing three runs total in 2 2/3 innings over two appearances. But you can’t expect a teenager who has yet to make his pro debut to dazzle while facing Major League stars. Sulbaran, Cincinnati’s 30th round pick in 2008, made quite a World Baseball Classic debut when he came out of the bullpen in the sixth inning against Puerto Rico in a first-round game. Inheriting men on first and third with two outs and a 1-0 lead, the first batter he faced was Ivan “Pudge” Rodriguez, a free agent who was showcasing his hitting skills. Sulbaran struck out Rodriguez on three pitches. One inning later, after loading the bases on a double, a single and a hit batter, he got out of the jam by getting Carlos Beltran to ground out to end the inning. So who is this kid anyway? The Curacao-born Sulbaran was impressive enough in his home country in his teens that teams began approaching him to turn pro. But his dad, Jorge, had other ideas. The Sulbaran family moved to the Miami area in 2006, where he attended American Heritage High School, a team that featured such talented classmates as first baseman Eric Hosmer, the third pick overall last spring by Kansas City, and catcher Adrian Nieto, the Nationals’ fifth-round selection. Sulbaran, honored as the Miami-area pitcher of the year for 2008, fell to the 30th round due to his commitment to the University of Florida but the Reds eventually signed him with a $500,000 bonus, a record for that round. Not that Sulbaran was idle that summer. Having caught the eye of the Dutch Olympic team’s coaches during an earlier international tournament when he limited the opposing club from Cuba to one hit over seven innings, he was invited to join the squad and pitched for Team Netherlands in Beijing. In the Olympics, he once again faced Cuba, this time a slightly older and more experienced squad, allowing two earned runs over 4 2/3 innings in a loss to that squad. And that showing pretty much wrapped up his invitation to join the World Baseball Classic squad where, once again, he was the youngest member of the team , three weeks younger than fellow pitching phenom Dennis Neuman of the Red Sox. While both experiences were rewarding in their own ways, Sulbaran thinks the World Baseball Classic may have been more educational. Sulbaran, whose repertoire includes a hard sinker, a good curveball and a changeup, remains in Reds camp in Sarasota nursing a blister which will likely push his pro debut back a bit longer, until he can go six or seven innings. He can’t wait till he can get out there and officially start his pro career, expected to be at Class A Dayton, but don’t think that facing Midwest League batters will change his game plan. Our “Beyond the Boxscore” interview was shorter than usual because of technical issues (don’t you hate excuses like that) and also because I couldn’t ask him some of the usual questions about his minor league career thus far, but I am really hoping to get the chance to cross paths with him this season, watch him pitch again, and do a more in depth interview. Juancarlos Sulbaran: Finishing high school. In Curacao, everyone leaves school when they’re 15 and never finishes high school. Now that I’ve graduated, I’m really glad that my dad made that decision for me. JCS: Probably working with my dad for his contracting company. JCS: I have soccer skills. JCS: I like watching movies, playing soccer, and just hanging out with my friends. JCS: Don’t like pitching that much! I was a first baseman and third baseman. And for me, baseball was always more about how to get on base, steal a base, slide, get dirty and make diving catches. But I’m learning more about pitching now. JCS: (Dutch teammate pitcher) Sidney Ponson. Whateer he says, whatever he does, it always makes you laugh. JCS: Let all the pitchers hit! Once you meet veteran outfielder John Gall, you may never listen to Guns N’ Roses the same way again (that is, of course, if you listen to Guns N’ Roses). Gall, currently in the Houston Astros system, uses the hard rock band’s first hit, “Welcome to the Jungle” as his “walk up” music when he comes to the plate. This spring Round Rock Express fans will be welcoming Gall to town and will be treated to that song each night, as Gall’s .375 average in 16 spring training games as a non-roster invitee were not enough to crack the Houston opening day roster. Express fans are probably already familiar with Gall, since he hit .357 with two homers and 12 RBIs against the club last year while with the Albuquerque Isotopes. In fact, he’s been something of a staple in the Pacific Coast League for several years now. 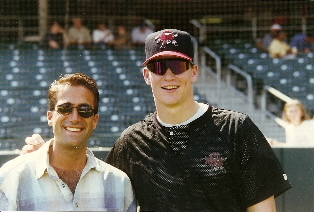 Originally signed out of Stanford University in 2000 by St. Louis as an 11th-round pick, Gall moved quickly through the Cardinals’ Minor League ranks, reaching Triple-A Memphis by 2003. Gall, who will turn 31 this week, has batted .298 over nine Minor League seasons with five .300-plus summers. But despite posting consistently strong numbers across the board, and hitting a combined .292 over four seasons with the Redbirds, he only got a brief taste of big league time. In 22 games up in his 2006 debut he hit .270 in St. Louis, and got a 12-at-bat sniff the next summer. He also gained a huge measure of respect for how that country went about its baseball business, enough so that he was not at all surprised by Korea’s recent success in both the Olympics, where they won the gold medal, and the World Baseball Classic, where they fell to two-time champion Japan, 3-2, in 10 innings in the title game. Gall also enjoyed watching one of his old teammates, first baseman/DH Dae Ho Lee, nicknamed “Big Boy,” in the WBC. Gall couldn’t root for “Big Boy” quite as enthusiastically in the Olympics, however, since he himself was playing for the bronze-medal winning US Olympic Team in Beijing (the US lost to Korea, 8-7, in their lone head-to-head game). John Gall: My family. Happiness is at home with my wife and son. A cliché, but true. JG: I’d be broke somewhere in mid-town Manhattan wondering what just happened. JG: Weatherstripping. No heat escapes my house in the winter!! JG: I love cooking. I spend hours reading cookbooks and working my own recipes, rubs, etc. JG: Drink five cups of coffee a day. JG: “Gossip Girl.” I’m a member of the Chuck Bass fan club. JG: (Houston Astros GM) Ed Wade. So I could put myself on the Houston Astros 25-man roster. JG: The brutal nature of the business. Good players have their dreams crushed in a very casual manner. Sometimes guys that could have been productive big leaguers get pushed out. I feel lucky to have played as long as I have. MLB: On your most recent club (Albuquerque Isoptopes), what was your favorite thing about playing there? JG: We had a great group of guys. Somewhere on the internet you can find some ridiculous videos of John Baker, Tagg Bozied, myself and others re-enacting movie clips. ‘Topes Cinema. MLB: In your career, what has been your favorite road trip and why? JG: I like going to Salt Lake City to visit my good friend’s bar and restaurant, Lumpy’s. And both the city and ballpark are picturesque. MLB: What is the best minor league promotion or visiting act you’ve seen? And the worst? JG: The best promotion ever was the “Gall-mobile” during the 2002 season in New Haven. Somebody won my 1984 Cadillac El Dorado with the $2 purchase of a foam ball. What a deal! And the worst promotion I’ve ever seen was also the “Gall-mobile.” I think I signed some stinky cleats and game balls and threw ’em in the trunk. PHOTO COURTESY OF CARL KLINE/MiLB.com! The odds are good that Oakland Athletics first base prospect Sean Doolittle hasn’t had to spend much money lately on new batting gloves or sweatbands. Like most ballplayers, Doolittle admits to having his share of superstitions and, again like most ballplayers, those often center around “lucky” apparel or equipment. But since signing with Oakland in June 2007, those slumps have been few and far between. In 2008, his first full season, the left-handed hitter combined between Advanced A Stockton and Double-A Midland to hit .286 with 22 homers and 91 RBIs before batting .293 in an Arizona Fall League stint. It’s looking like the As’ decision for him to focus on offense over pitching was the right one. A star pitcher and top hitter in high school, a large part of the reason Doolittle opted to attend Virginia was the school’s willingness to let him see time as a two-way player. He admits that, especially when he began his pro career, the little pitcher in his head would talk to him when he was at the plate. His recent big league spring training appearance saw him bat .357 in 18 games, leaving a good impression before being reassigned to Minor League camp. By the way, is it just me, or has anyone ever seen Doolittle and Cleveland Indians first base prospect Jordan Brown in the same place at the same time? This picture of Doolittle, taken by Paul Gierhart, is on the top. The one below it is of Brown, taken by Michael Janes. I think they look like they could be brothers. Very good-looking brothers, of course. And coincidentally, both happen to be terrific former journal keepers for MLB.com and, in fact, Doolittle is one of our Minor League bloggers for 2009 … you can read his blog here when he starts keeping it when the season gets underway! Sean Doolittle: I’ve been lucky enough that I’ve had a lot of things in my career of which I’m very proud. My career at UVA, getting drafted by the A’s in ’07, representing my country on the baseball field for two summers during college. However, two accomplishments standout for me personally. In 2004, my high school won the state title and I racked up 23 K’s in our extra inning state championship game. And in the summer of 2006, I was a member of the National Team that earned a gold medal in the World University Games in Havana, Cuba. SD: I think right now I’d be in school, finishing up my Psychology degree, figuring out exactly what I wanted to do. However, I’m fairly certain I’d stay in the game as a coach, probably on the college level. SD: Ok, I don’t know a foreign language. I don’t know any magic tricks. I’m a pretty simple guy, out of the what you see is what you see is what you get mold. I can read music and can dabble on the piano and I have a drumset at home and I can handle myself on that, although I’m no Stewart Copeland. I’m pretty good with words too…as long as they’re on paper. I’ve always done well with anything that had to do with putting thoughts and pictures into words, and wouldn’t mind making a living doing something related to that someday. Maybe that’s how I should have answered your previous question! SD: …lived in California between the ages of 3-6 and spent my summers driving to Oakland where we had season tickets to Oakland A’s games. It was my first exposure to baseball as a little kid so it’s really cool how things have (almost) come full circle. SD: The summer after my freshman year in high school I got a job at my middle school with a buddy of mine working on the maintenance staff. We did everything – mopping floors, painting walls, replacing light bulbs, moving furniture. My parents made me get a job, but that was miserable. I’ve stuck to given lessons ever since! SD: If “Friends” or “Seinfeld” is on TV, I’ll put the remote down, even if I’ve seen the epidodes already. But I’m cranky if I miss out on some Thursday nights on NBC. “The Office” and “30 Rock” are my two favorite shows. SD: Does “Guts” count? How about “Legends of the Hidden Temple”? I’m pretty sure I’d dominate the Aggro Crag, and I’d be one of the better Blue Barracudas to ever set foot in that temple – none of those temple guards would dare get in my way! As far as actual shows that are still on TV? Cash Cab, no question. I’d have him driving all over Manhattan while I answered all those random questions! SD: Bear Grylls. I’d love to go out into the wilderness for a few days and survive off the land, especially because he goes to some really cool places. I don’t know how many days I would last or if I’ll ever be as awesome at life as he is but it would be really fun to give it a shot. SD: Ok first of all, I don’t really think anyone would go see that movie. Maybe they would wait for it to come out on DVD. Or just rent it from a Red Box somewhere. Vince Vaughn is one of my favorite actors so I think I’d cast him and give him free reign to do some improv and talk all fast and make it interesting so people would actually watch it and have a laugh or two. SD: The travel, no doubt. Spend one night on the floor of a bus going from Midland, TX, to Corpus Christi, TX, and see how you feel! And then try to play a game later on that day! SD: Jake the Diamond Dog, no question. As if it weren’t enough that I love dogs, he’s a Golden Retriever that can act as a bat boy or go after foul balls or even bring the umpires water between innings. He was in Kane County when I was playing in the Midwest League in 2007 for a few games and he put on quite a show. As far as the worst? I don’t really know. I’ve worn my fair share of ugly uniforms for some promotions so far in my career but they’ve been for pretty decent causes so I can’t really label them as bad promotions now can I?